Mrs. Todd and her Roadrunners are looking at Outback Australia. 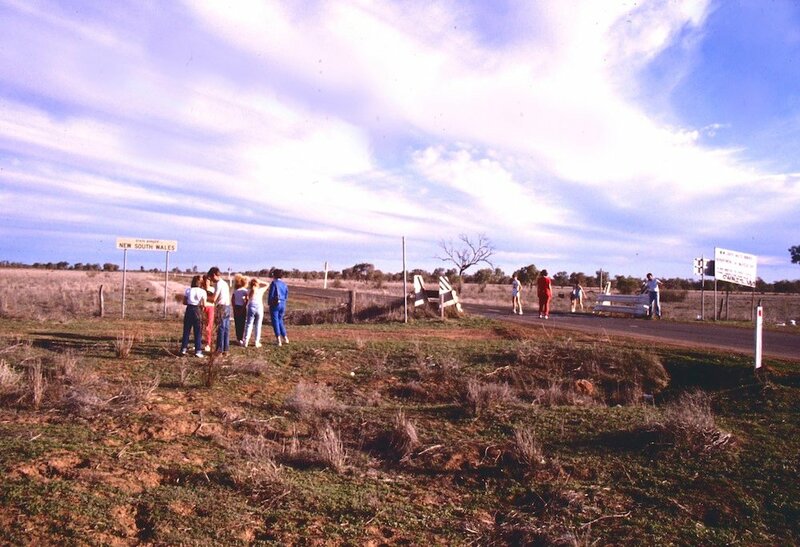 This is a post about an Outback journey I organised for parents and children from a school back in 1985. It's hard to believe those students would now be about 40 years old. 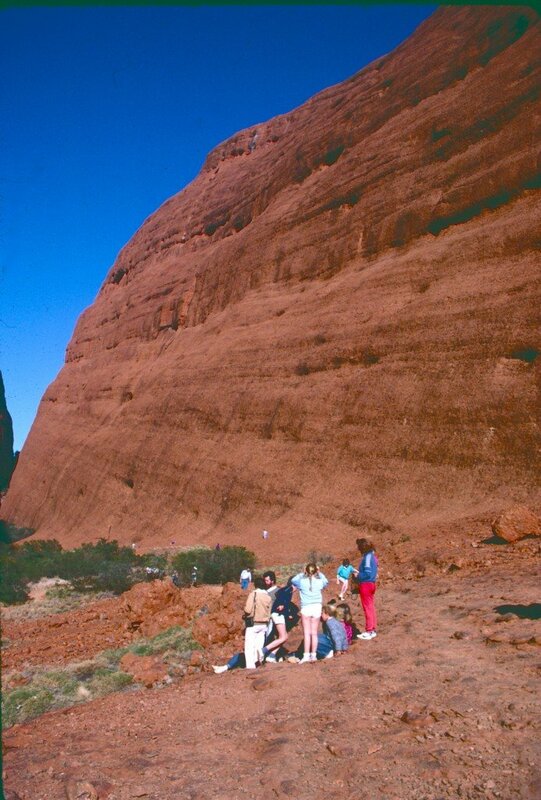 In this post, some video clips I had taken back in 1985 as my group travelled to Uluru and back have been shared. They have been converted from VHS tapes to digital and are being shared for the first time. 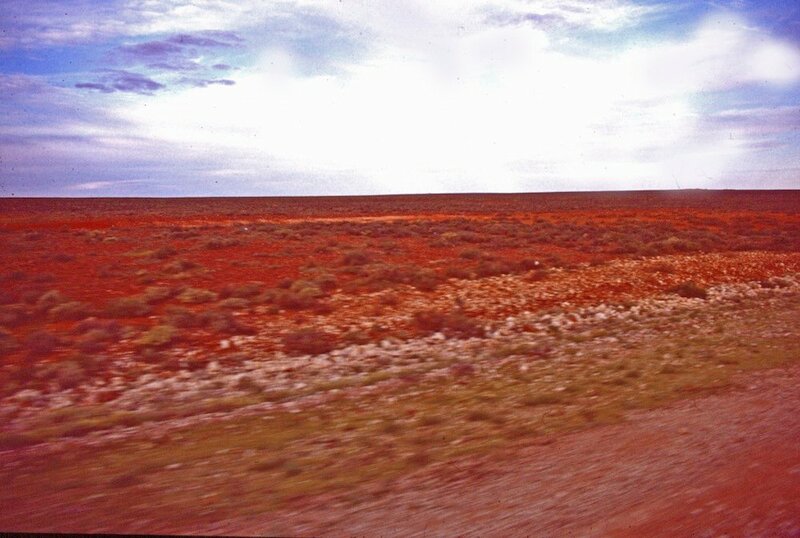 I don't know exactly where The Outback is said to start but I've always understood it to be the more isolated, arid (desert-like) areas across the centre of Australia. 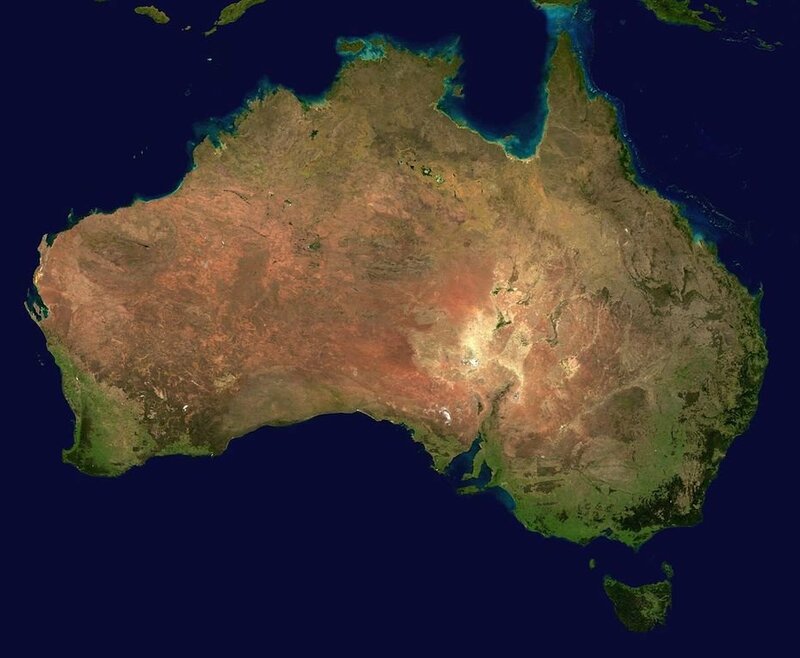 Most Australians live in coastal areas although there are larger communities in some Outback areas including traditional land owners, miners and graziers (cattle ranchers). If you look at this photo you can see green areas are mostly coastal whereas from the west (left on the photo) to most of the way east you see reds, browns and even white. The white areas, especially the very white areas are not snow. They tend to be salt lakes and high salt areas only filling with water when there are very heavy rains in Queensland. Once the water reaches the lakes, it has nowhere to go as the lakes lie below sea level. The water evaporates and leaves the salt behind. Let's look at the journey my group took back in 1985. 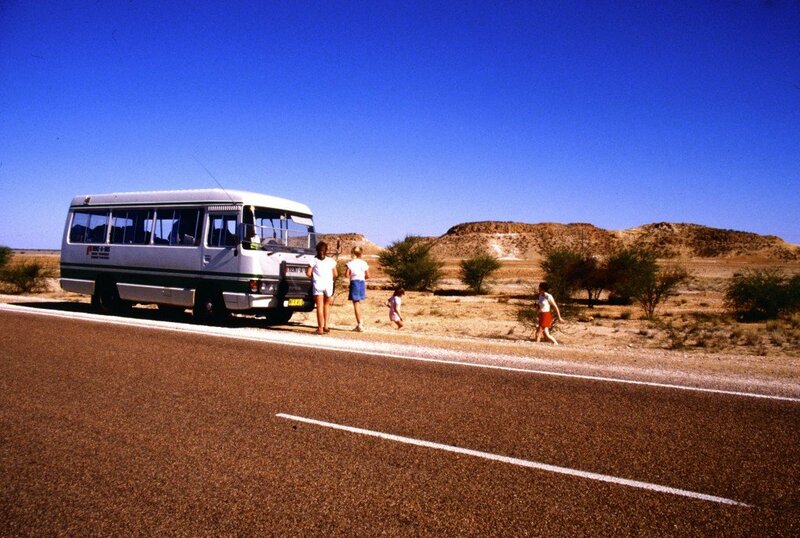 I was the tour organiser and minibus driver on our two week, 7000+km (4350+mi) journey into The Outback and back . 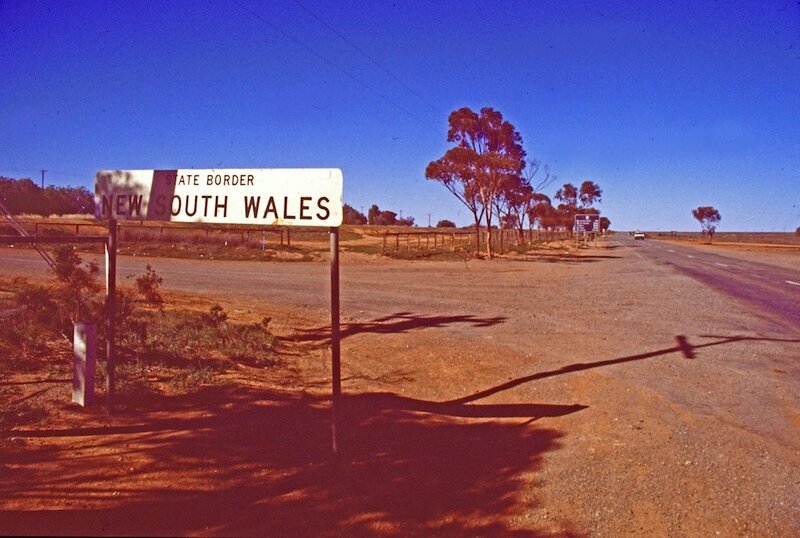 We started out in Sydney, the capital of the state on New South Wales and headed west then turned north to spend our first night in an isolated school where I had worked in the early 80s. 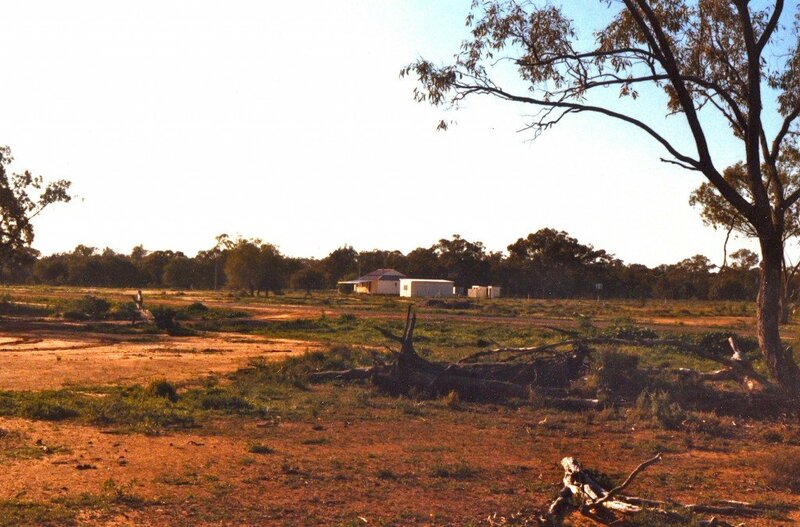 The school, Marra Creek Public School, is about 670km (415mi) from Sydney and lies 100km (62mi) from the nearest town of Nyngan. It served children from local sheep and cattle properties. I stayed at a neighbouring shearer's house about 20km (13mi) from the school. Was the school in The Outback? It was isolated, used water from tanks, had a phone where you had to talk to an operator to be connected, and only sometimes could pick up one television station if the conditions were good. 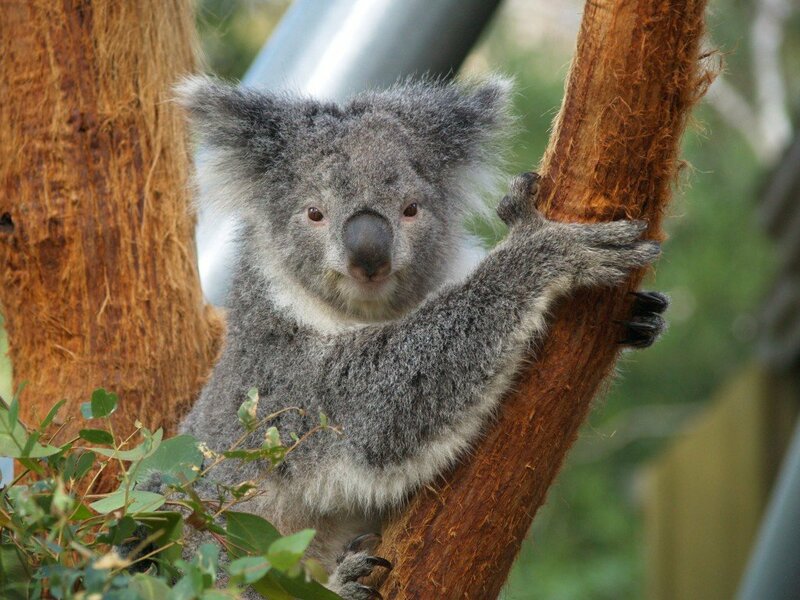 I sometimes had to chase emus and kangaroos or even wild pigs out of the playground. 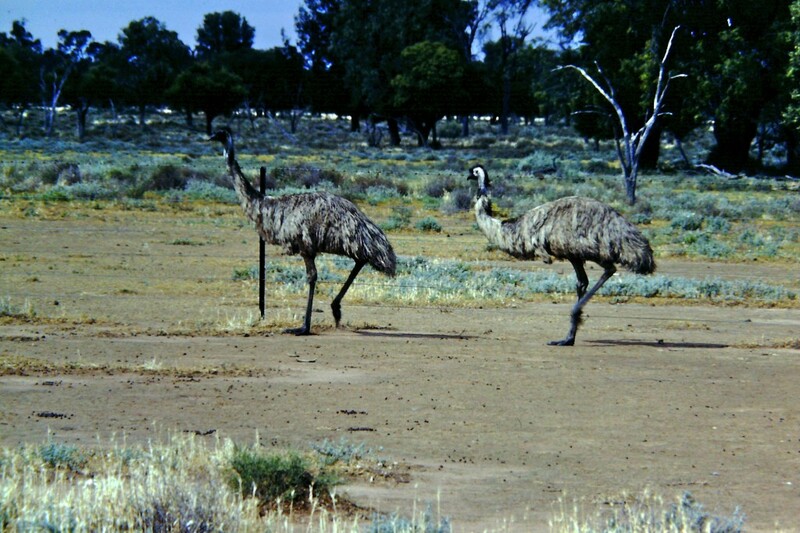 A video clip of emus in an animal sanctuary close to my home. And some kangaroos from the same sanctuary. 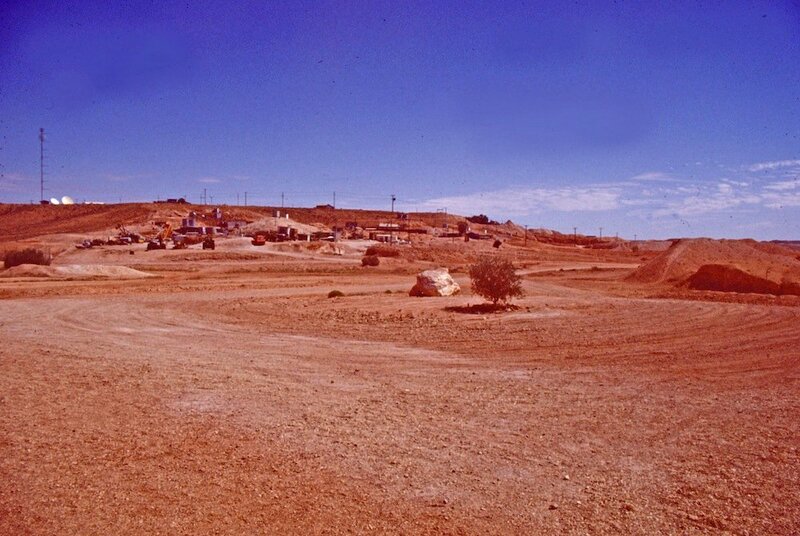 When I first started there we had been in drought and the water tanks were low, temperatures at times reached 47C (116F). With rains, the clay pans turned green with grass and roads became muddy. We didn't have snow days but we did have mud days when half of the students couldn't make it along the dirt roads. We didn't build mud men. Snow seems to work better and is cleaner. Heading across country, we visited the town of Bourke most would consider an outback town. 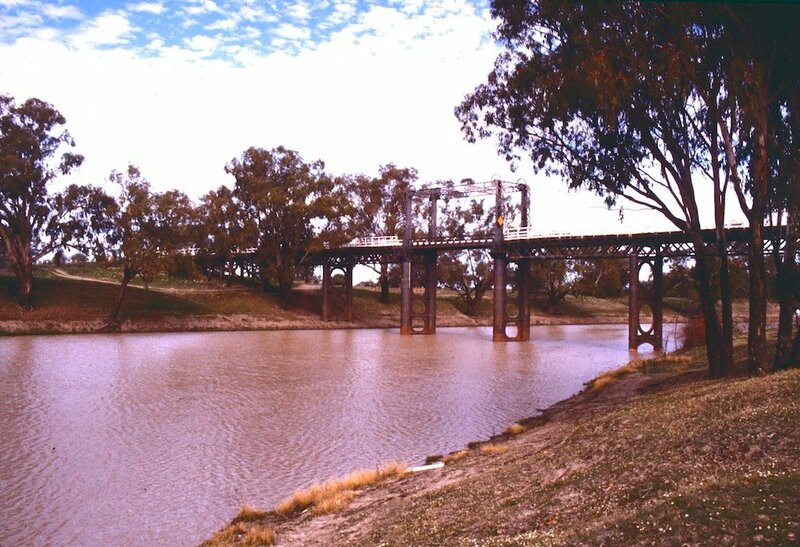 It lies along the Darling River, a river sometimes drying out if rains don't fall in Queensland and can also flood when heavy rainfall comes. On our trip, rainfall in the outback had been unusually good but still low compared to coastal. 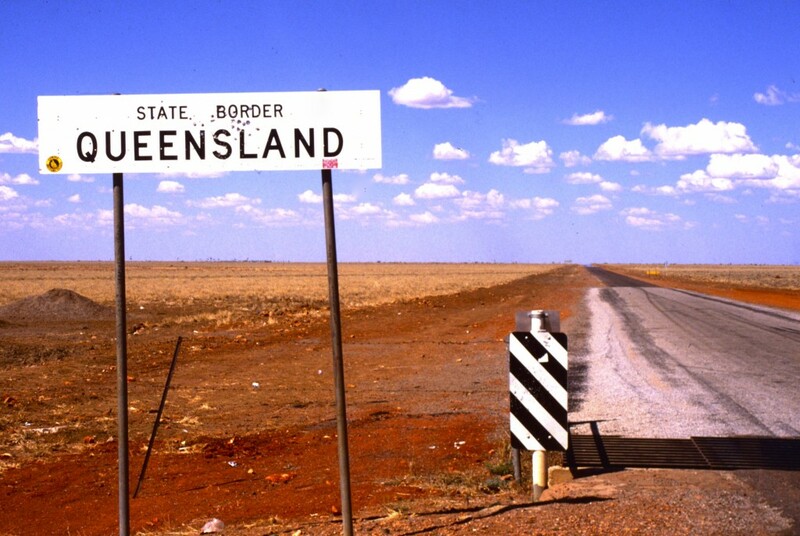 Not too far north of Bourke, we crossed into the state of Queensland. 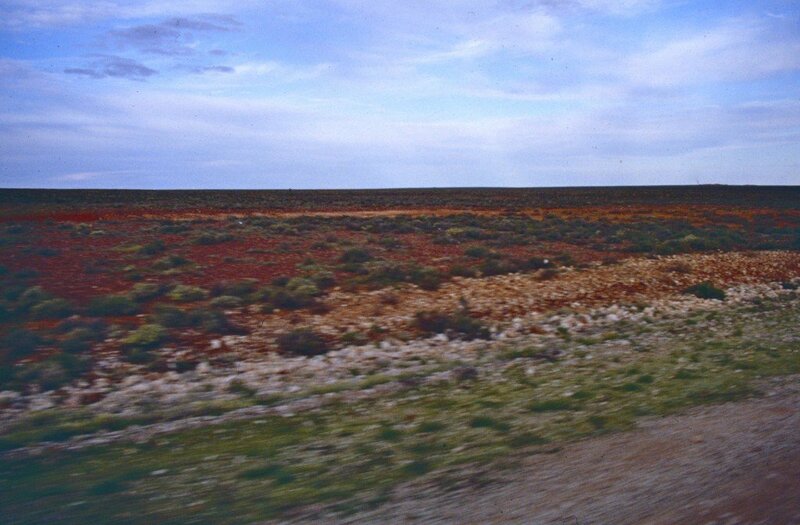 You can see in the photo below just how flat and semi-arid (almost desert) much of inland Australia can be. Heading north, we were heading towards the town of Longreach. The landscape had dried out. Stopping for the night, we were entertained by brolgas, the only cranes native to Australia. 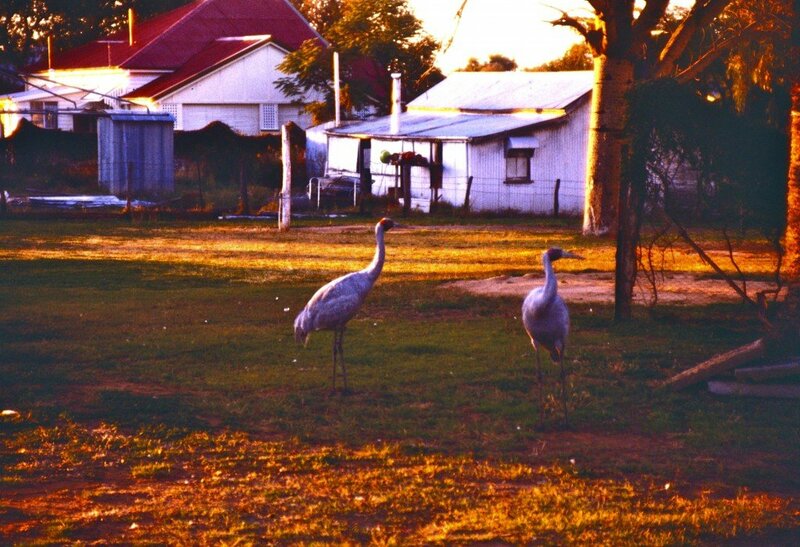 While at Marra Creek Public School, I had watched brolgas "dancing" their mating dance as they made jumps into the air. The video clip below isn't one of mine but shows the dance of the brolgas. 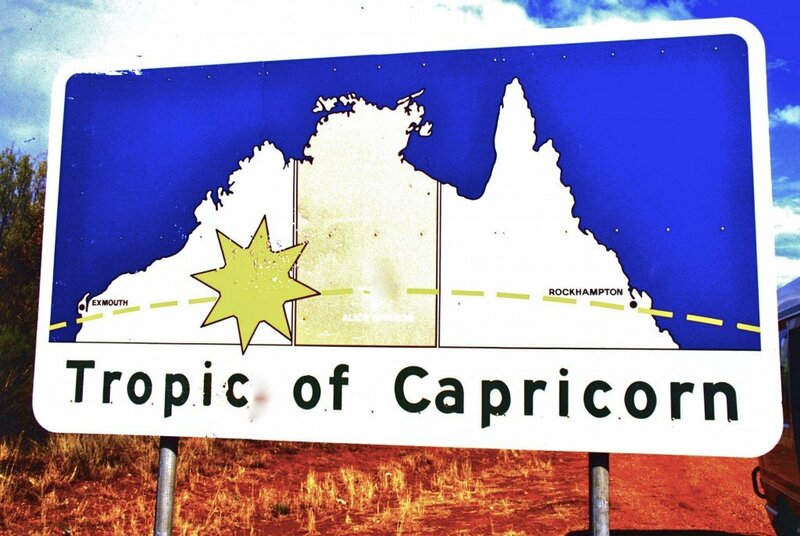 Just north of Longreach, we crossed the Tropic of Capricorn. This means we were now in the tropical region of the world. 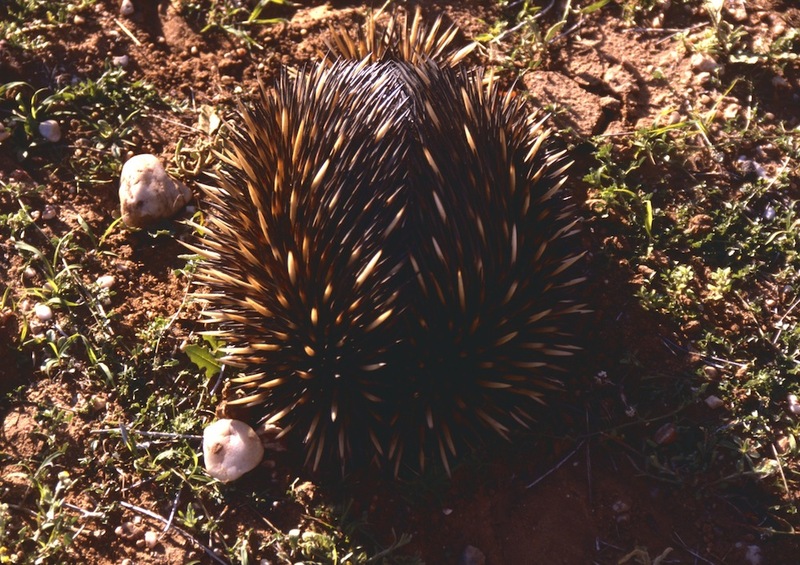 Near Longreach we saw an echidna on the side of the road. 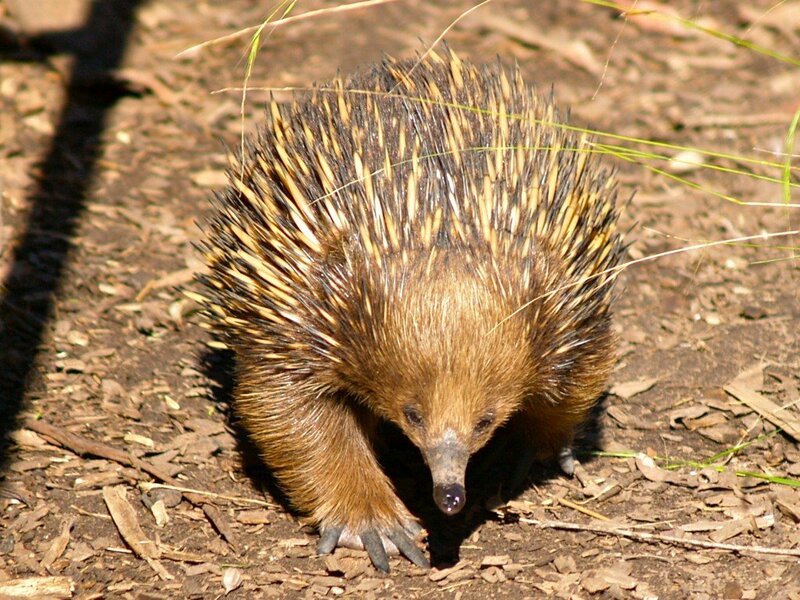 Echidnas and the platypus are the world's only living mammals that lay eggs but, as they are mammals, the mothers can give milk to their young. 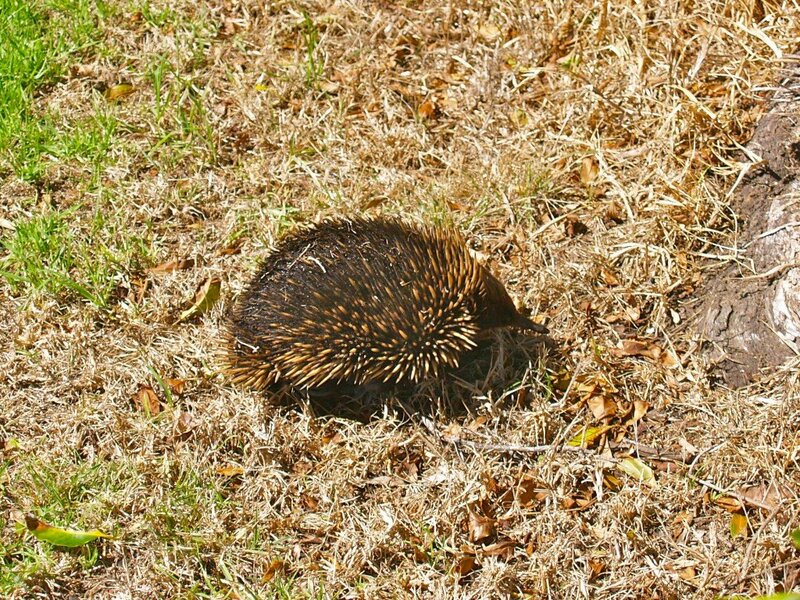 Echidnas are also found around my town and have sometimes visited my garden in search of ants. 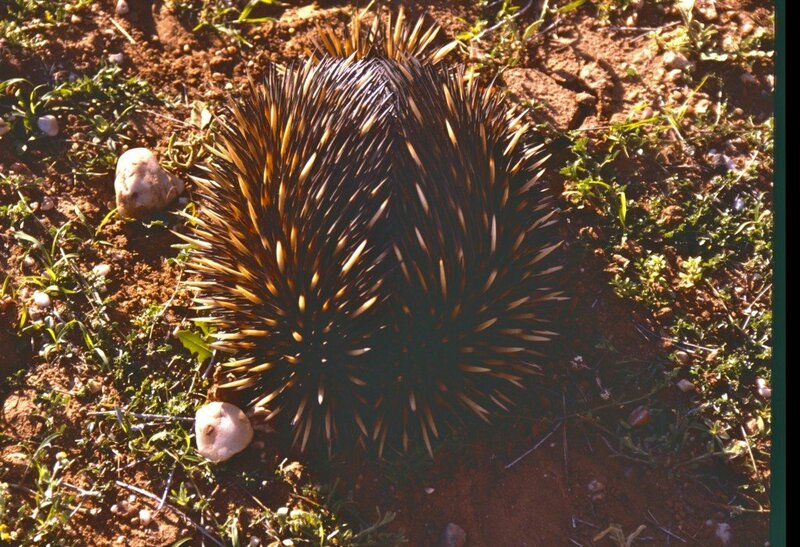 Below is a video of an echidna taken at an animal sanctuary near my home. 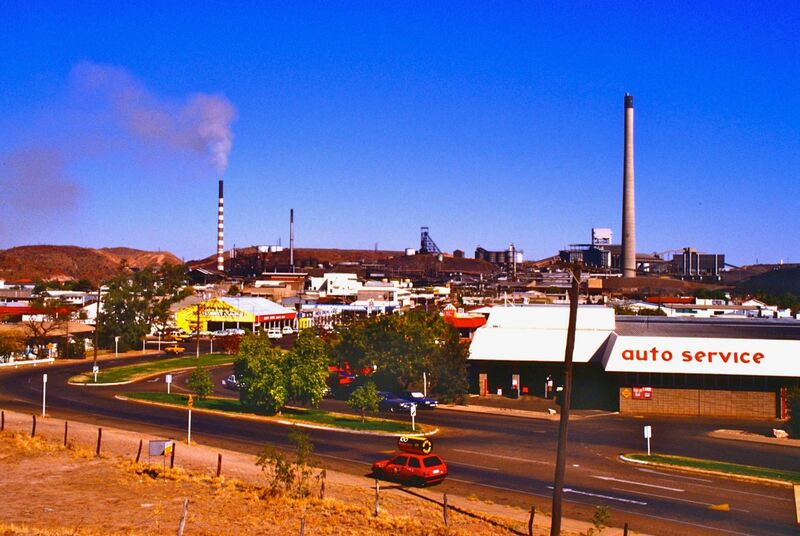 Our next major settlement was Mount Isa (pictured below), a mining town in western Queensland. 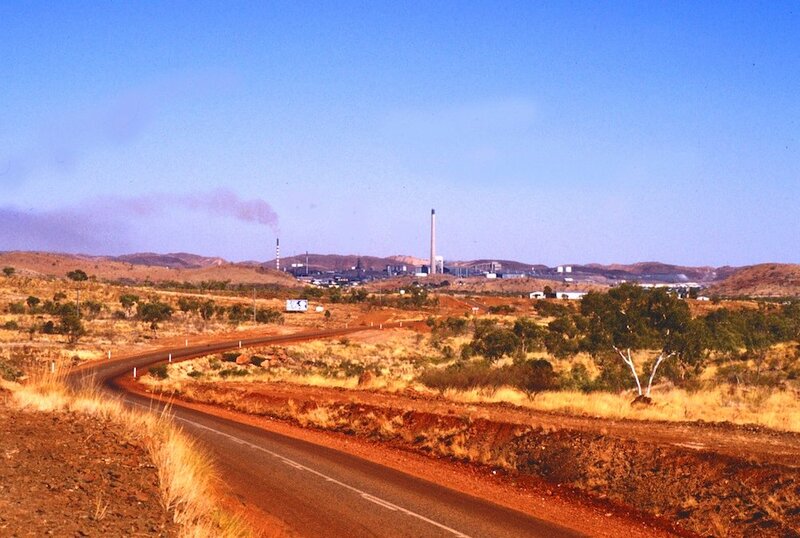 Lead, silver, copper and zinc are mined in the Mount Isa area. 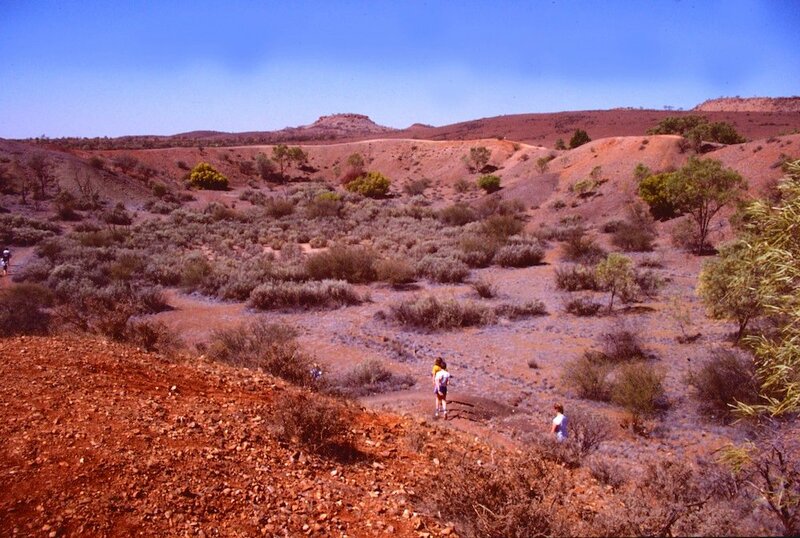 You can easily see the red of the soil, a soil colour so common in The Outback. From Mt. 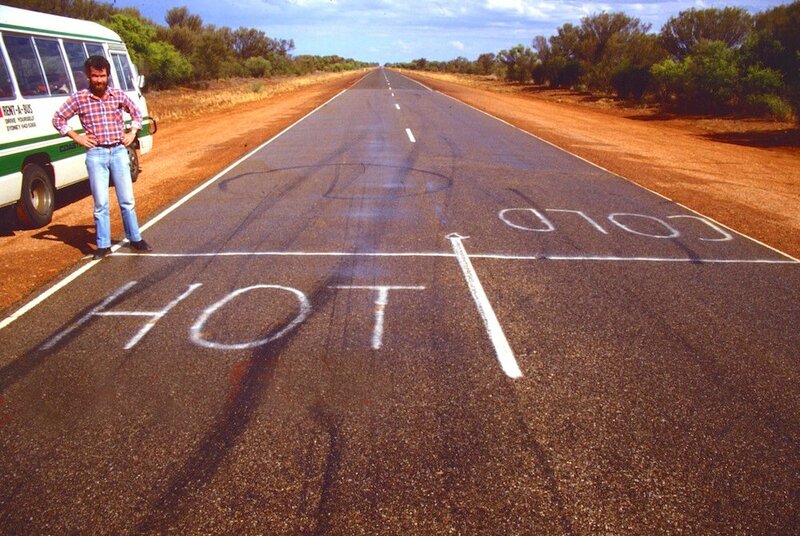 Isa, we head west to the border with Northern Territory. 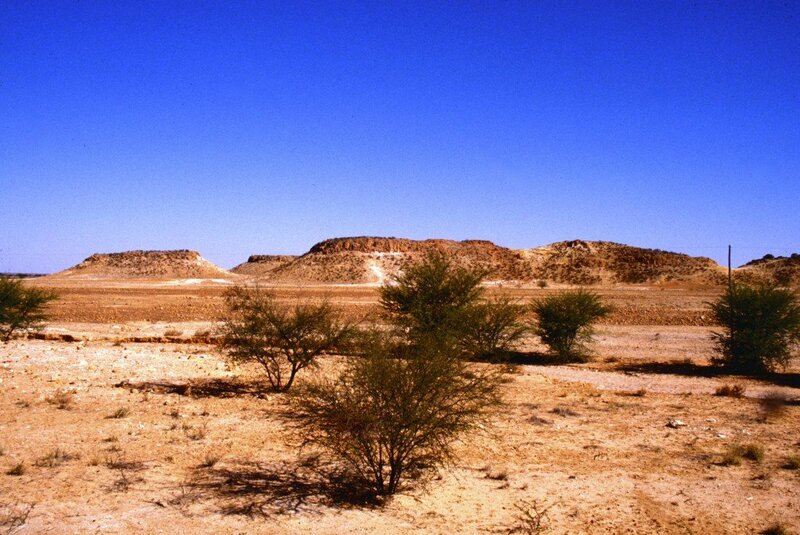 The photo below was taken standing in the state of Northern Territory looking into Queensland. 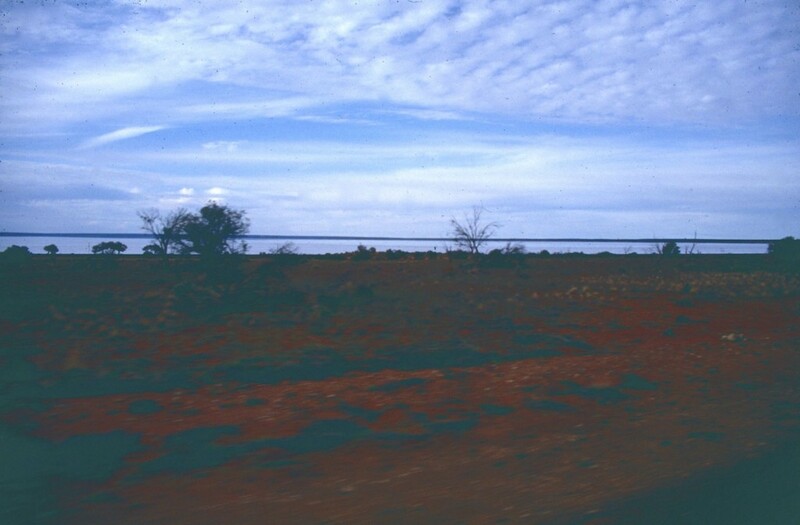 Reaching the Stuart Highway, a highway running from Adelaide, the capital of the state of South Australia, in the south to Darwin, Northern Territory's capital, in the north, we took a left turn because we had reached as far north as we were going on this journey. 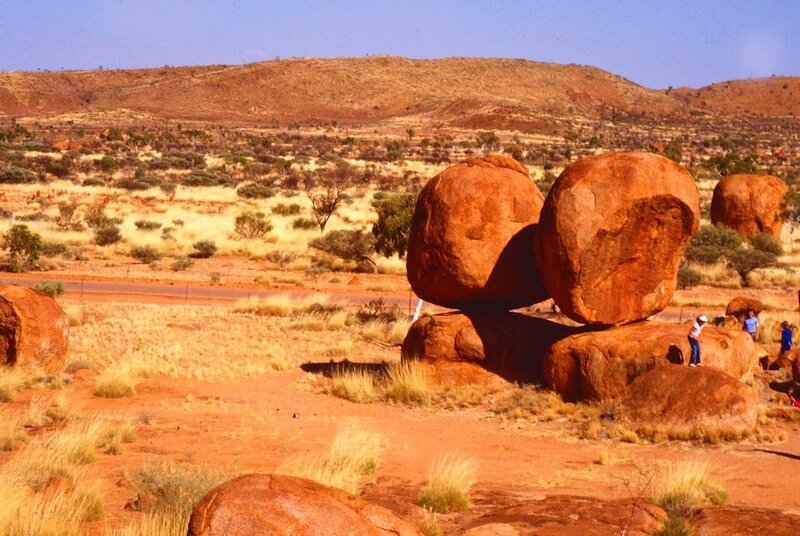 Passing through the town of Tennant Creek, our next major attraction was Karlu Karlu (known also as the Devil's Marbles) 105km (65mi) south of Tennant Creek. 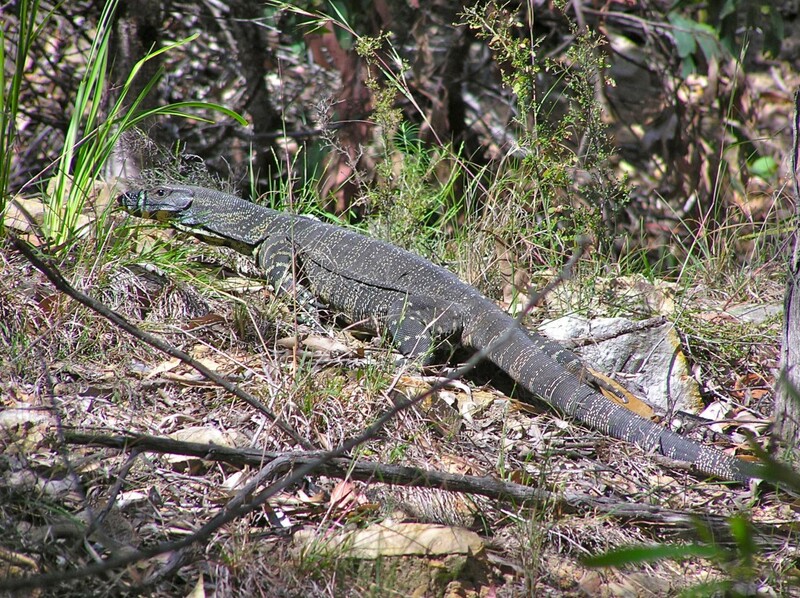 Here are some photos taken at Karlu Karlu. 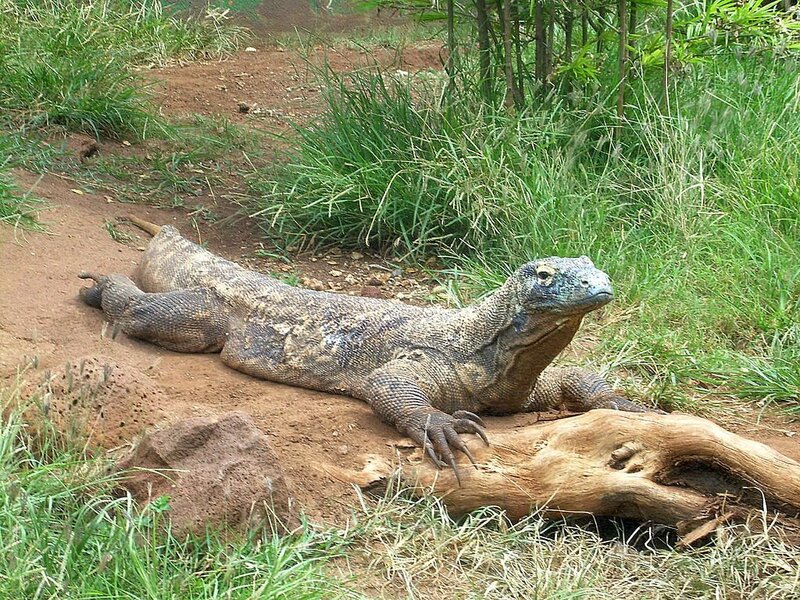 That's not me pretending to hold up the rock. The video clip below was taken on the 1985 trip and has been converted to digital and shared for the first time. 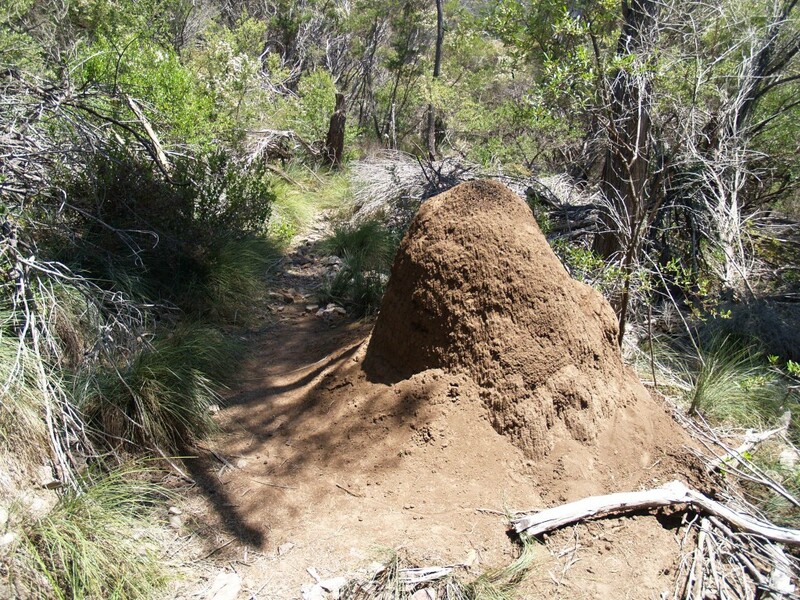 Karlu Karlu is a sacred site to the Alyawarre (Aboriginal) whose country includes the site. 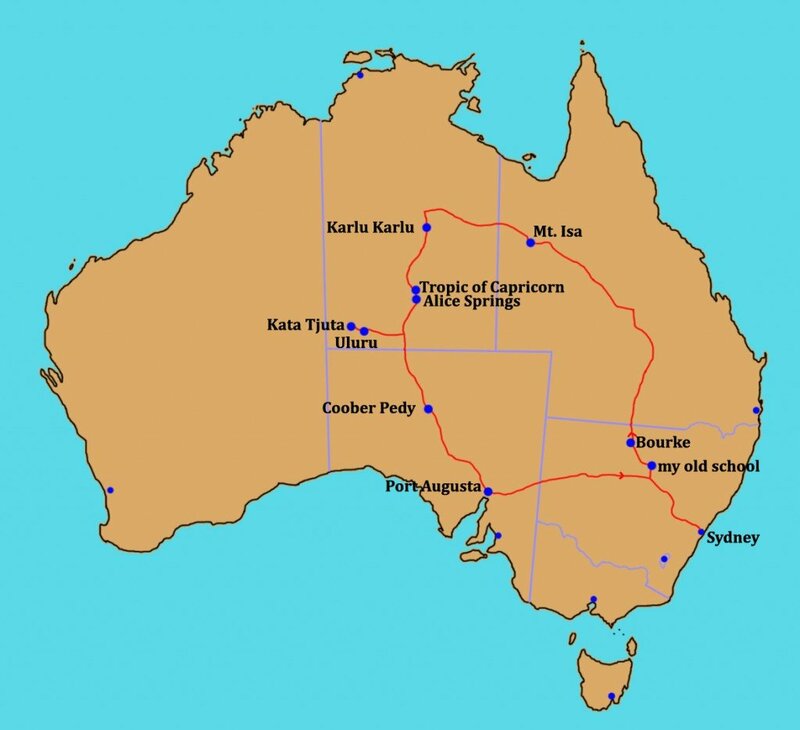 It's also sacred to the Kaytetye, Warumungu and Warlpiri people. 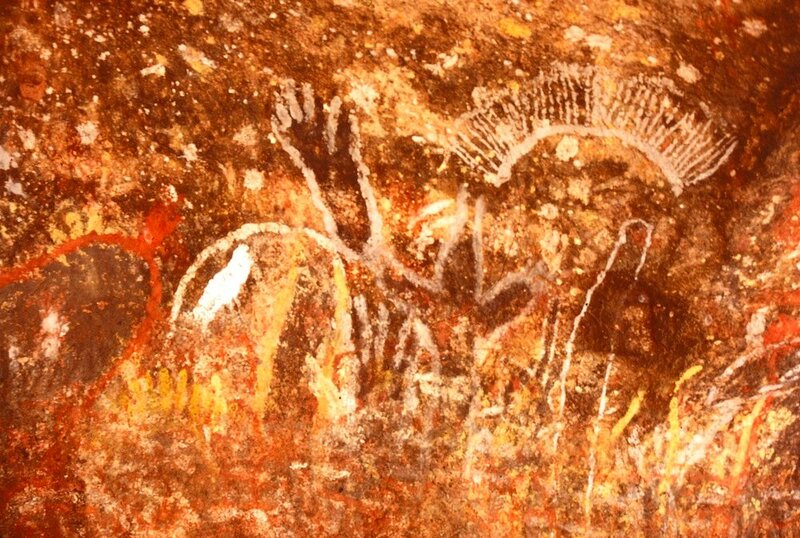 There are a number of traditional Dreaming stories for the Karlu Karlu area but only a few are able to be shared with uninitiated people such as us. 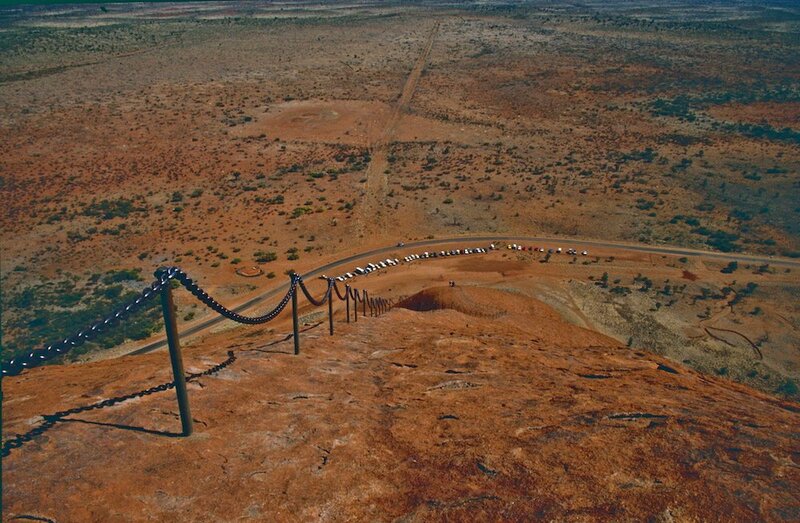 From Karlu Karlu, we continued south towards Alice Springs. 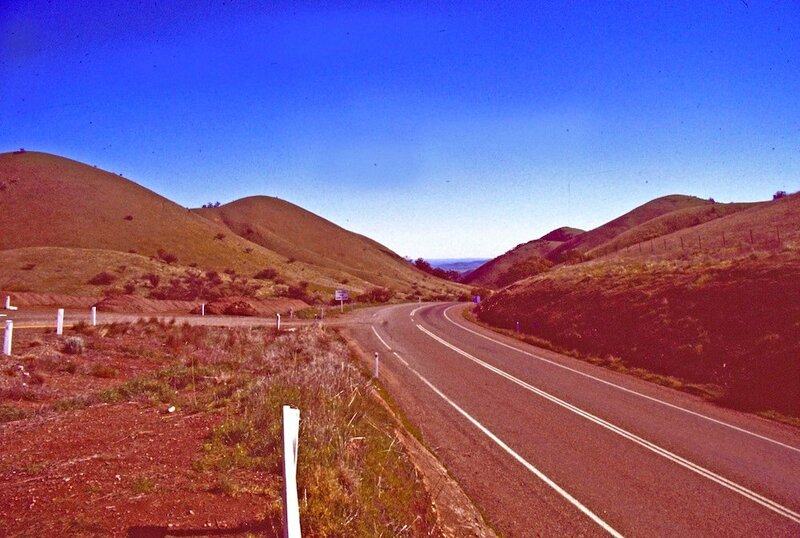 As we travelled, we again crossed the Tropic of Capricorn, this time heading out of the tropics. Someone with a sense of humour had painted words on the road (not us). 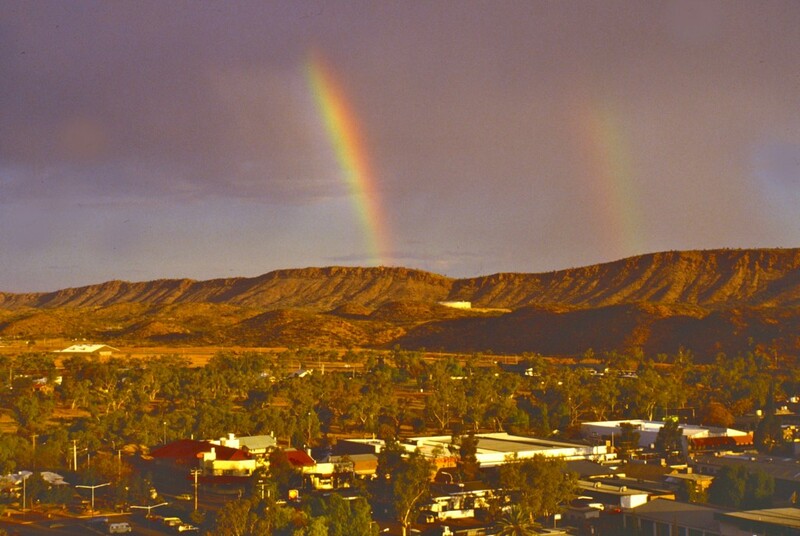 Alice Springs is the largest town in Central Australia and the third largest in Northern Territory. 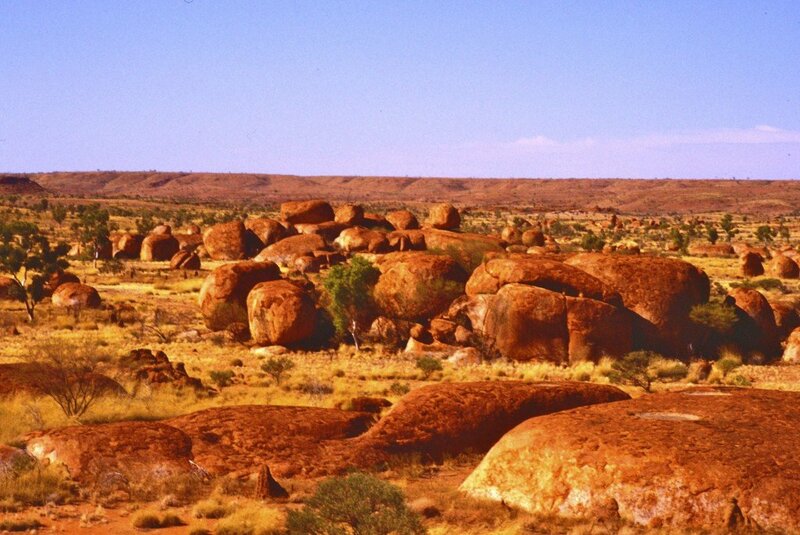 Central Australia is only a name for the area and is not a state. 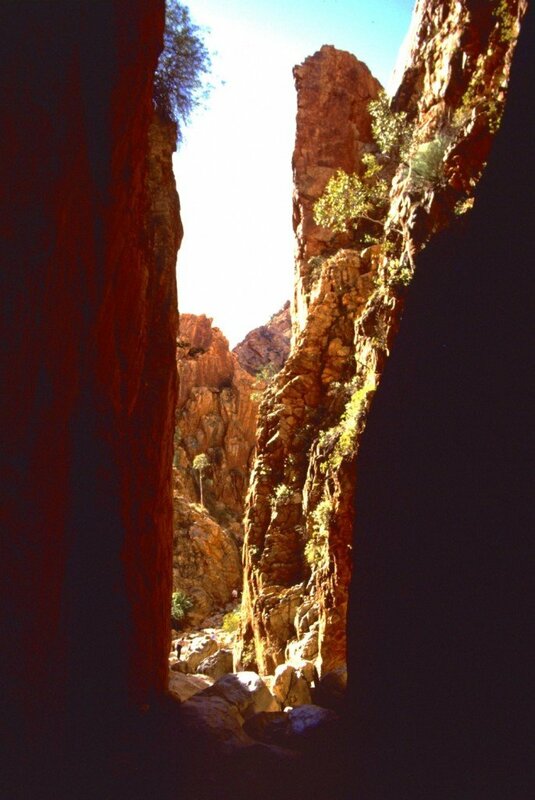 To the local people, the Arrernte, the Alice Springs area is known as Mparntwe. On our visit, we managed to see a rare rainbow over Alice Springs. 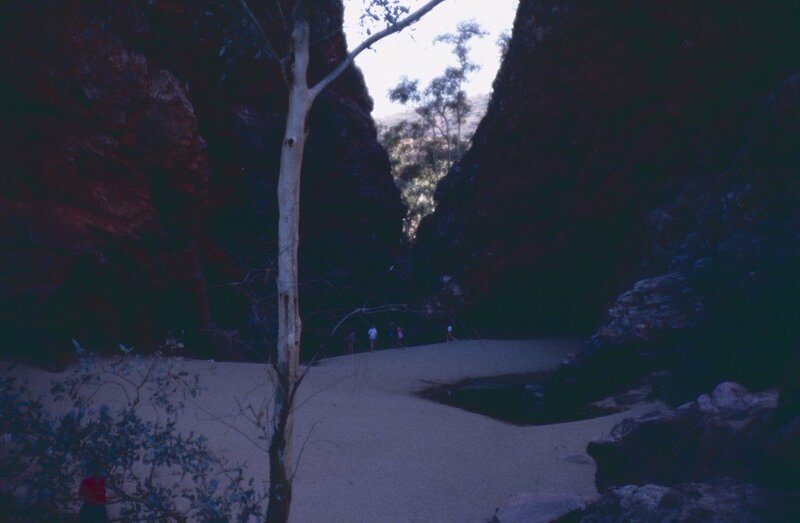 The video clip of Standley Chasm below was taken on the 1985 trip and has been converted to digital and shared for the first time. 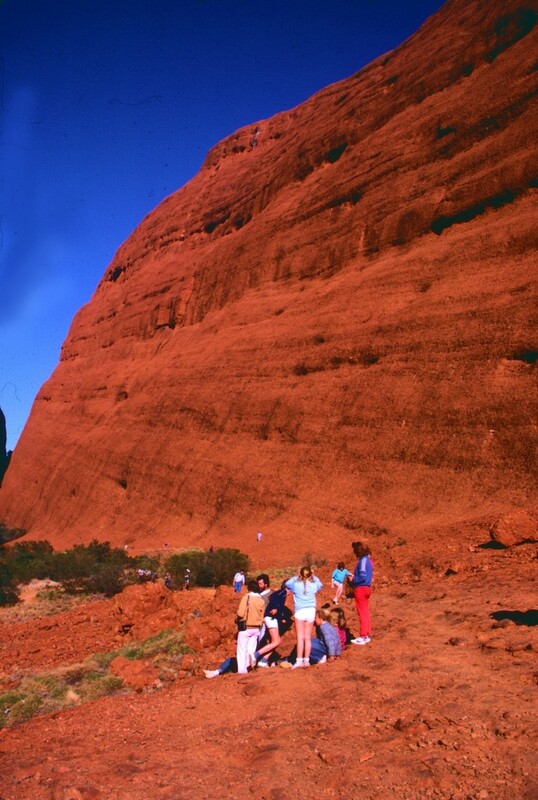 The video clip of Simpsons Gap below was taken on the 1985 trip and has been converted to digital and shared for the first time. 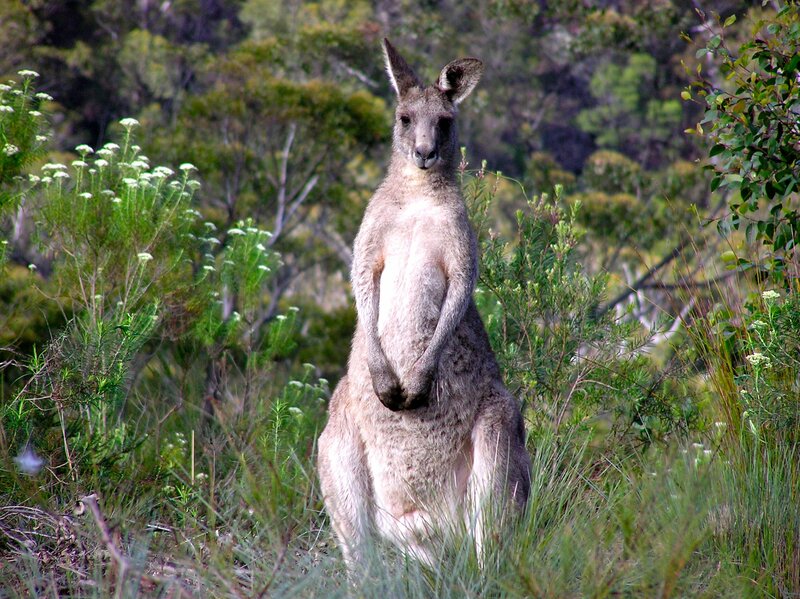 The video clip of black-footed rock wallabies below was taken on the 1985 trip and has been converted to digital and shared for the first time. 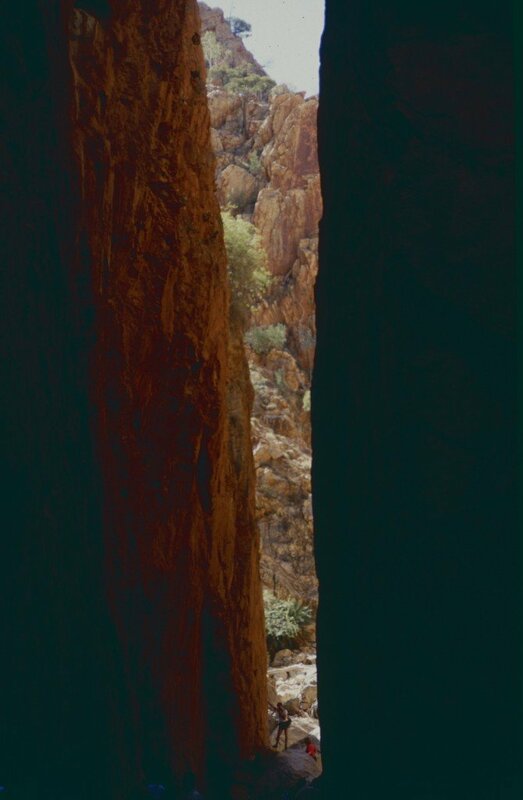 The rock wallabies were our companions as we explored Simpsons Gap. 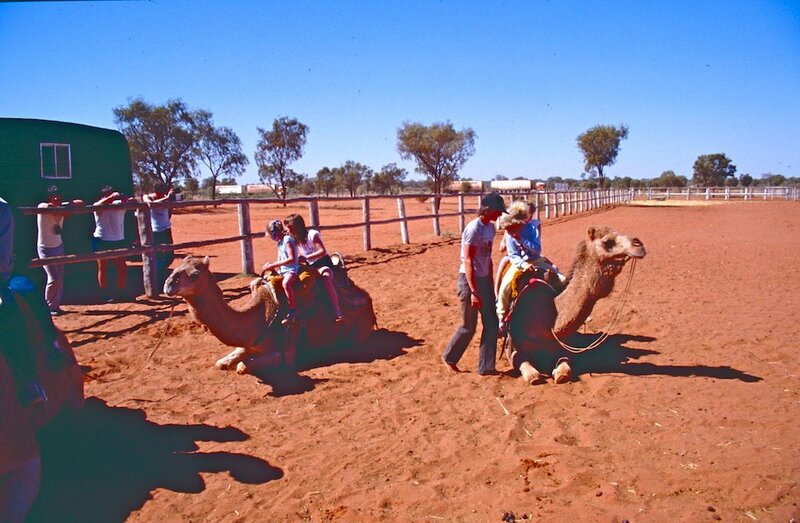 After leaving Alice Springs, we took time for a camel ride. 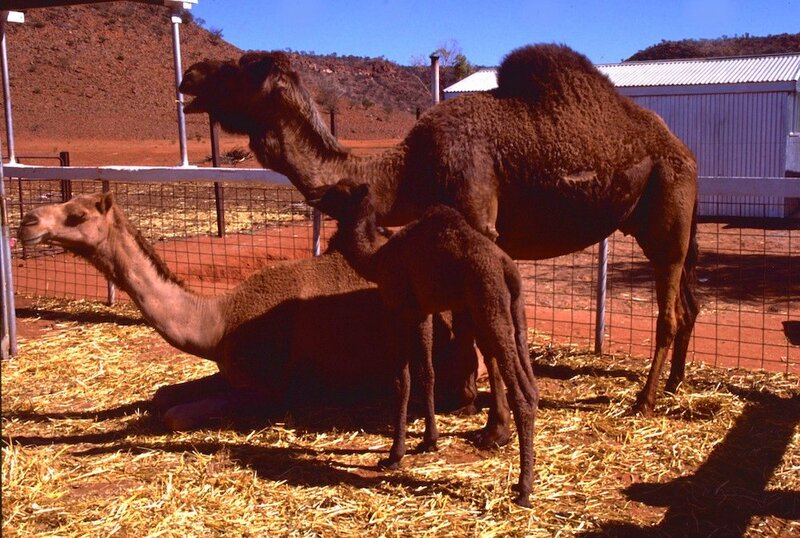 Camels aren't native to Australia but were brought here by Afghan camel herders in the 1800s. Before roads and railways, all supplies had to be brought in by camel trains. When road and rail arrived, many camels were released into the wild. Australia now is the country with the largest number of wild camels in the world and at times exports camels back to the Middle East. 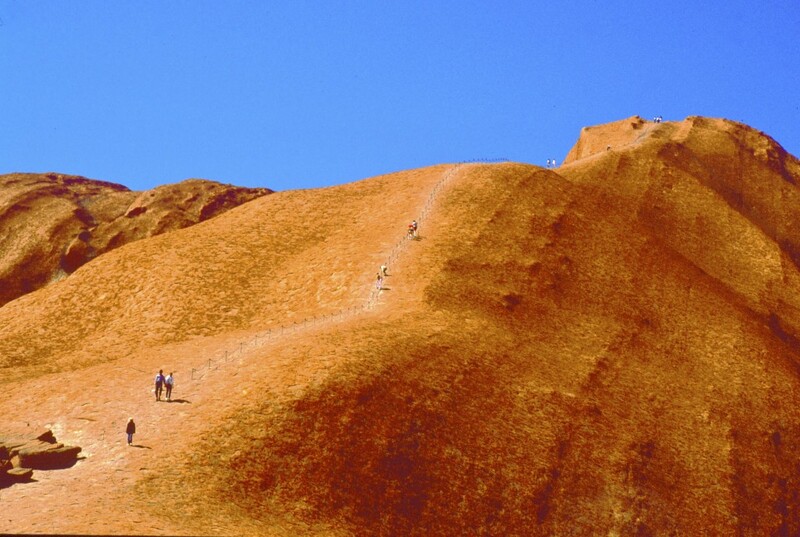 The video clip of camel riding below was taken on the 1985 trip and has been converted to digital and shared for the first time. 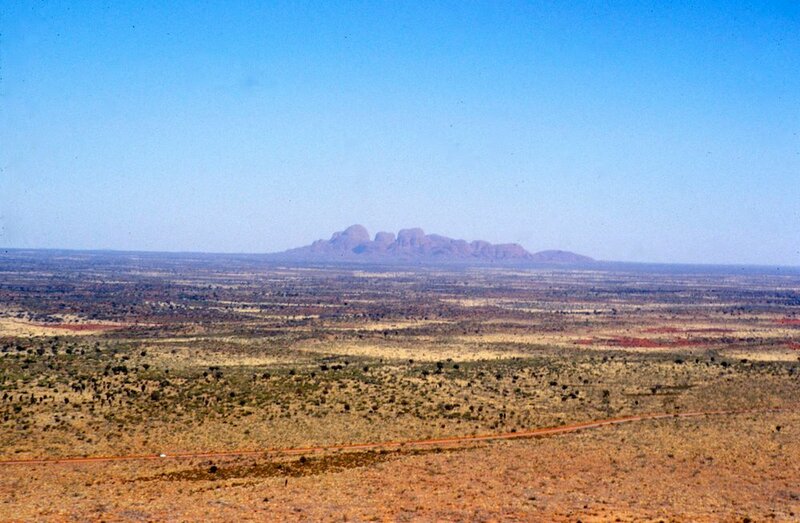 We were heading to Uluru and Kata Tjuta. 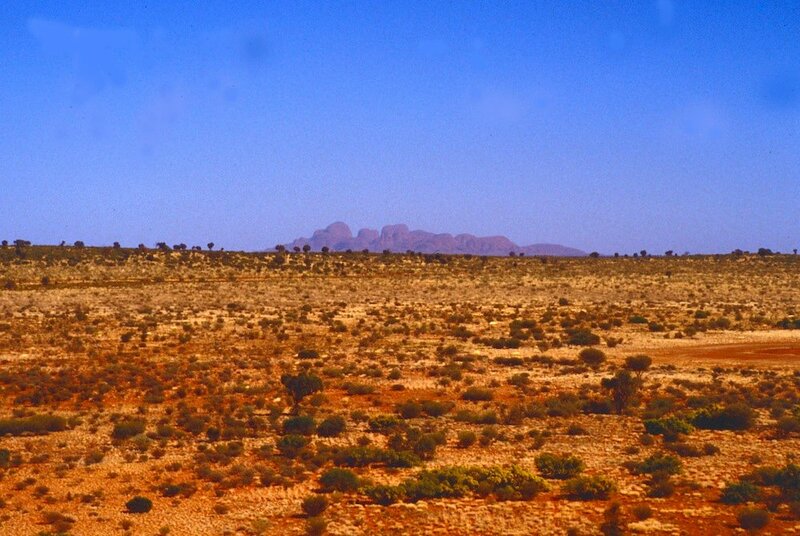 Along the arid way, we saw Mount Conner standing high above the desert. 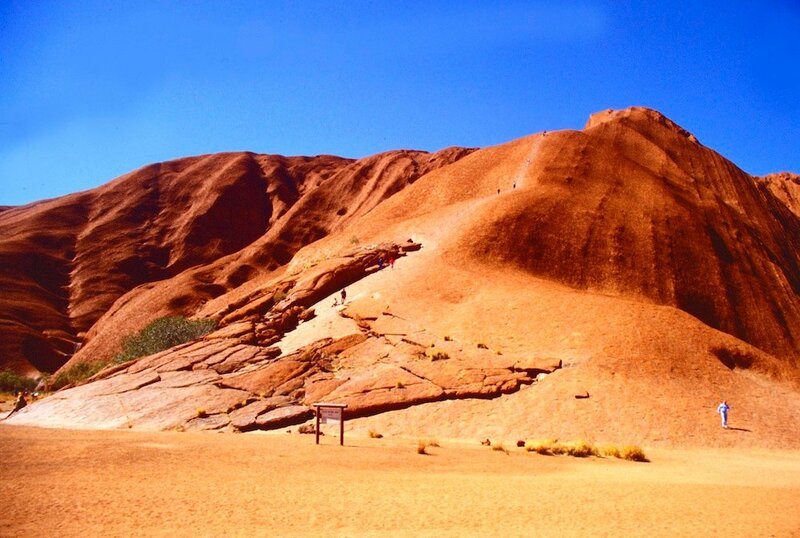 Tourists to Central Australia shouldn't miss a chance to see Uluru and Kata Tjuta. 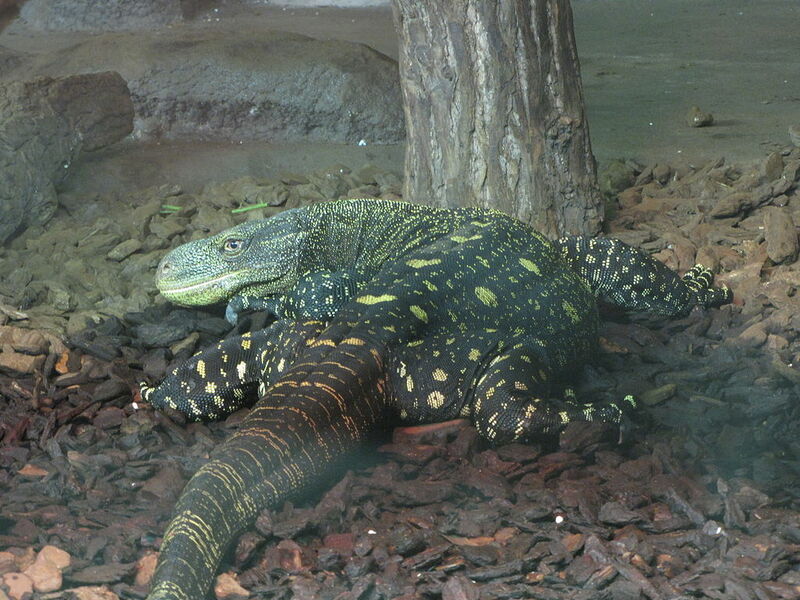 Here are some photos I had taken. 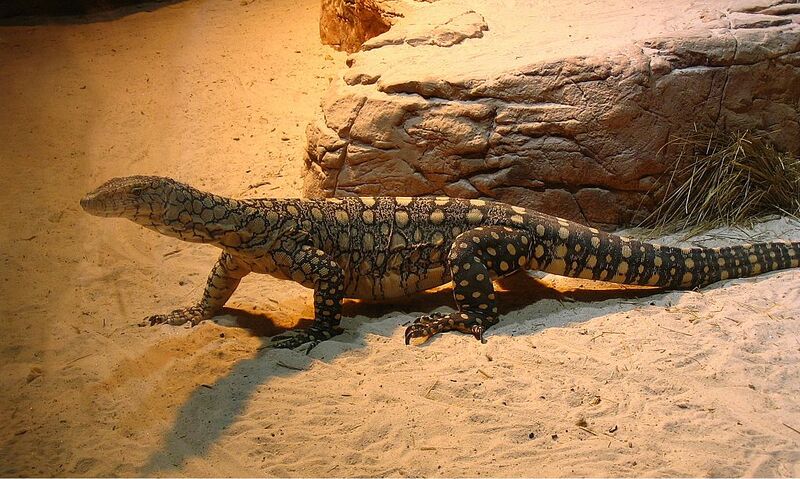 You can get an idea of its size by looking at the people climbing it. 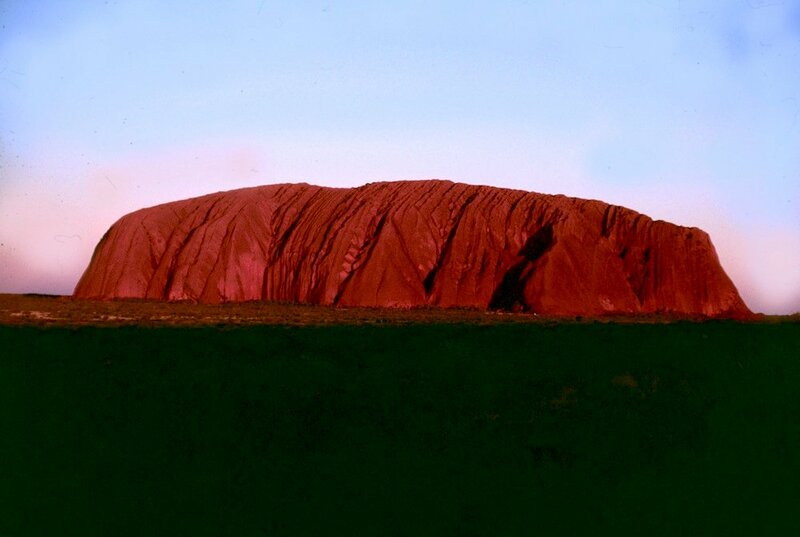 Since my visit 30 years ago, visitors have become much more aware of the importance of Uluru to the local people. While they don't stop visitors climbing the rock, many visitors now choose not to climb in respect for the beliefs of the local people. 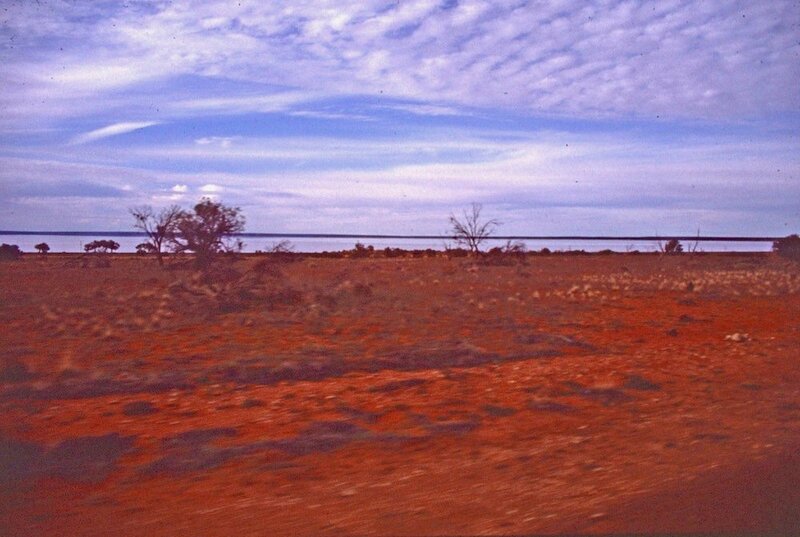 The video clip of an Uluru sunset below was taken on the 1985 trip and has been converted to digital and shared for the first time. It is running at 20x normal speed. 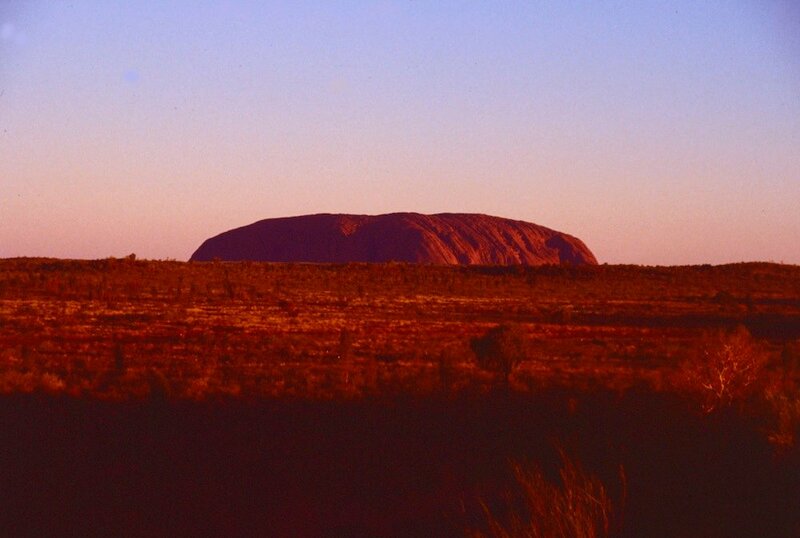 Around the base of Uluru, there are many sacred sites we are asked to respect. 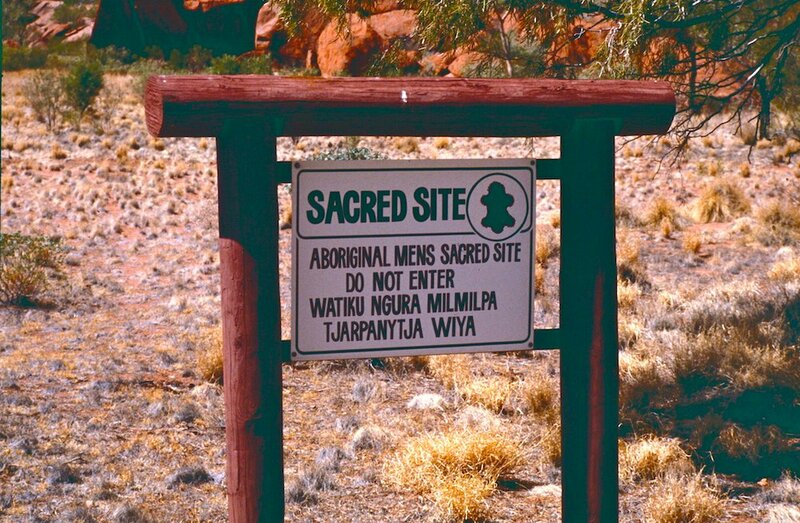 Some are sacred men's sites and some sacred women's sites. 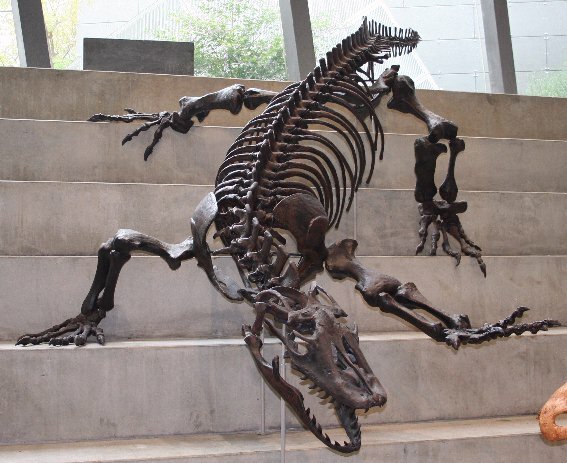 However, there are sites visitors can see. 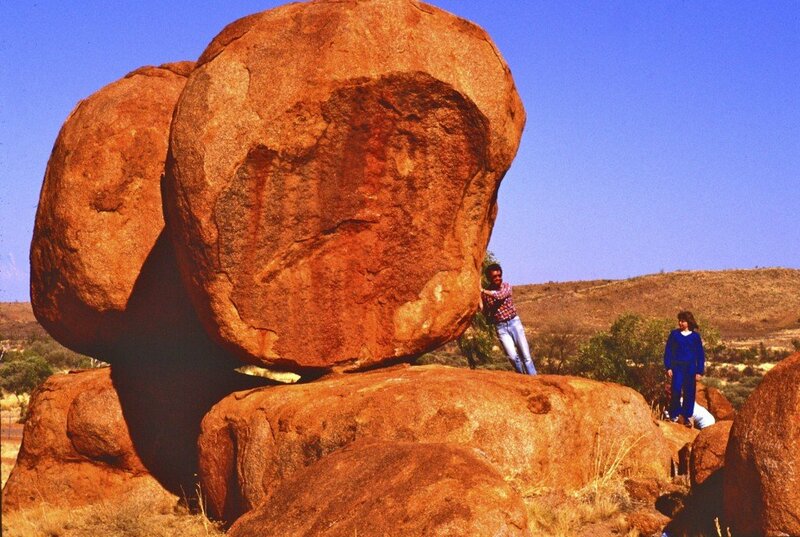 Here is a photo taken at one such site, Mutitjula (Maggie Springs). You can see some of the rock paintings. 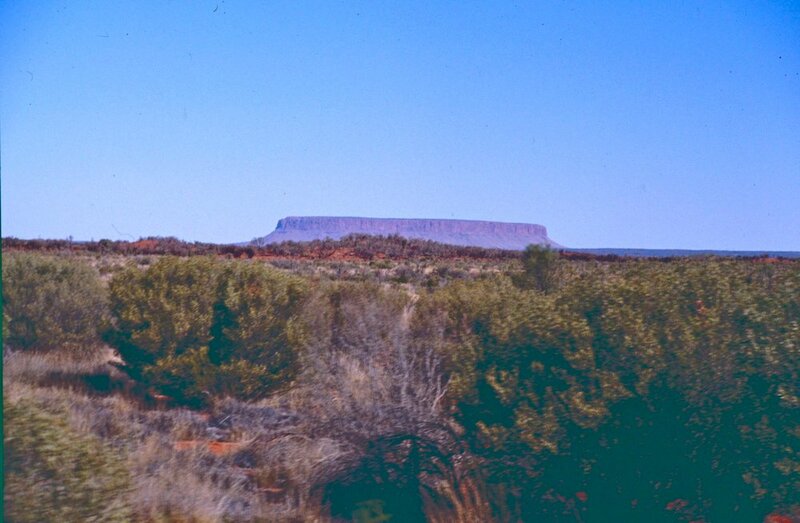 From Uluru, it is possible to see the distant Kata Tjuta rising from the desert plain. 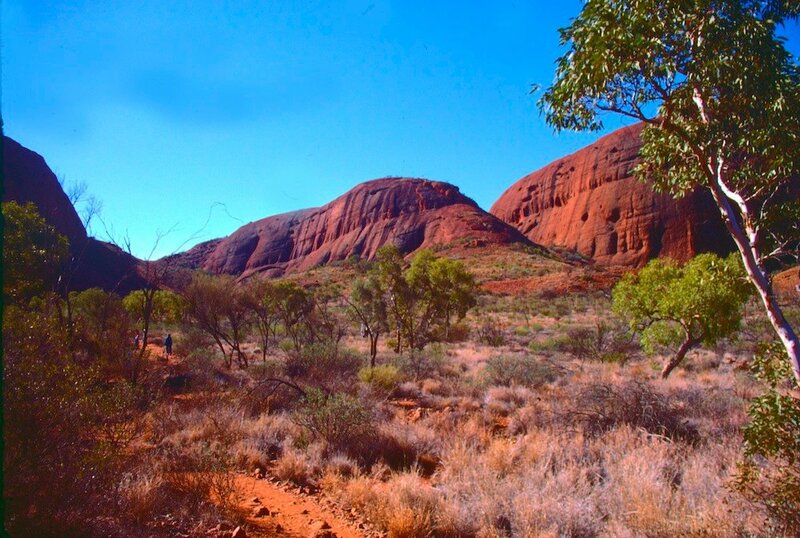 Back in our mini-bus, we headed along the dirt road to Kata Tjuta. On leaving Uluru and Kata Tjuta, we rejoined the Stuart Highway and again headed south crossing the state border into South Australia. 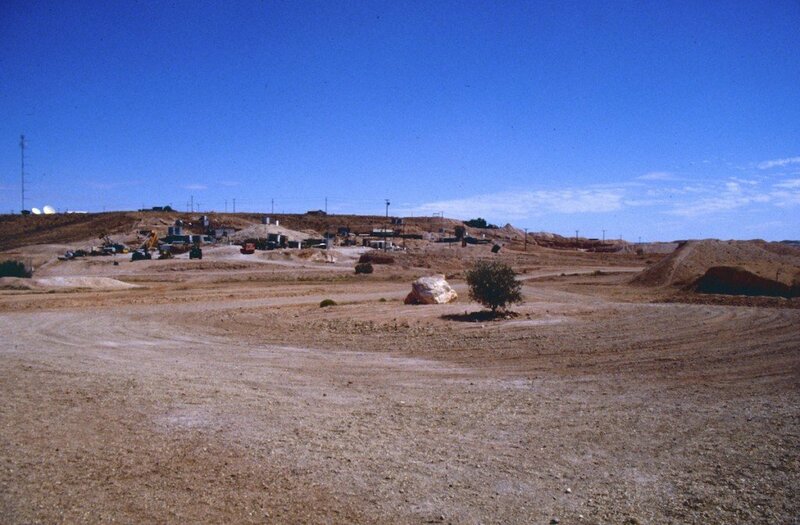 Our next stop would be Coober Pedy, famous for its opal mined in the area. 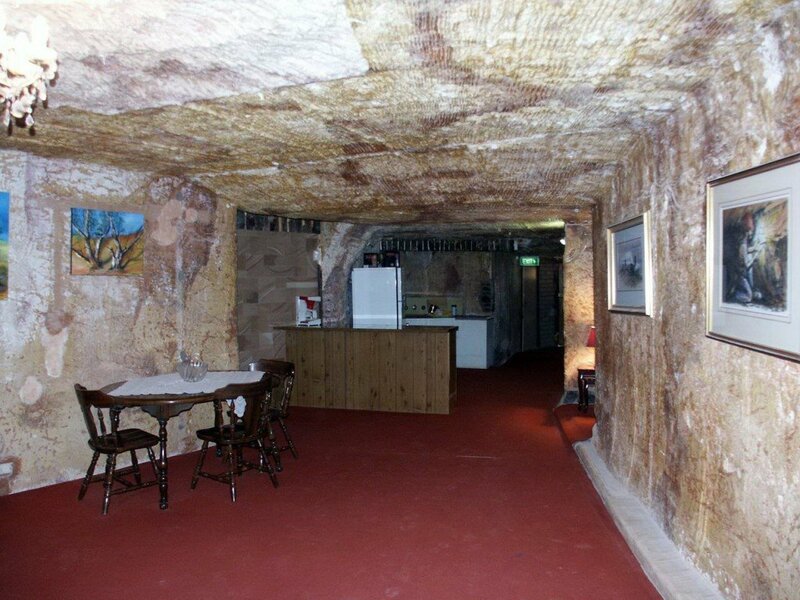 Because of the high temperatures on summer days, some homes in Coober Pedy have been built underground. Heading further south, we started to see salt lakes near the road. As they are lower than the distant sea, water entering can't flow out. The water evaporates and leaves the salt behind. You can see a late afternoon photo of a salt lake. There were many kilometres of flat roads as we continued south. 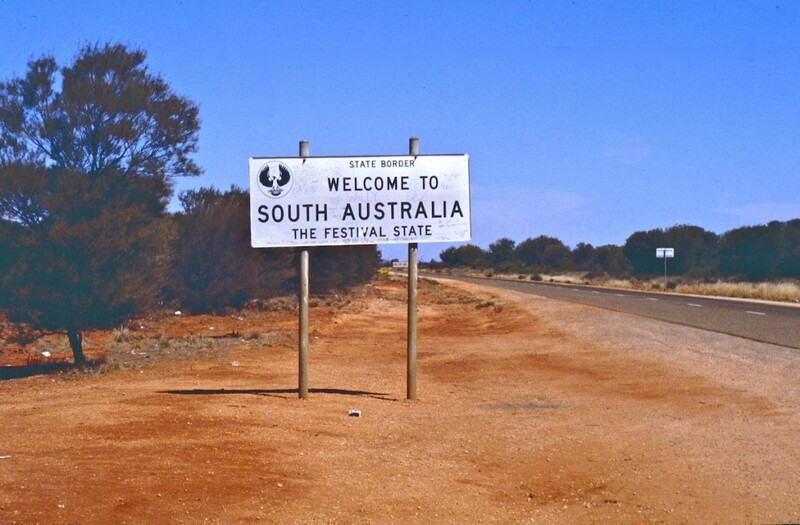 On reaching Port Augusta in South Australia, we headed east and back to Sydney. We had travelled over 7000+km (4350+mi) in our journey through The Outback. 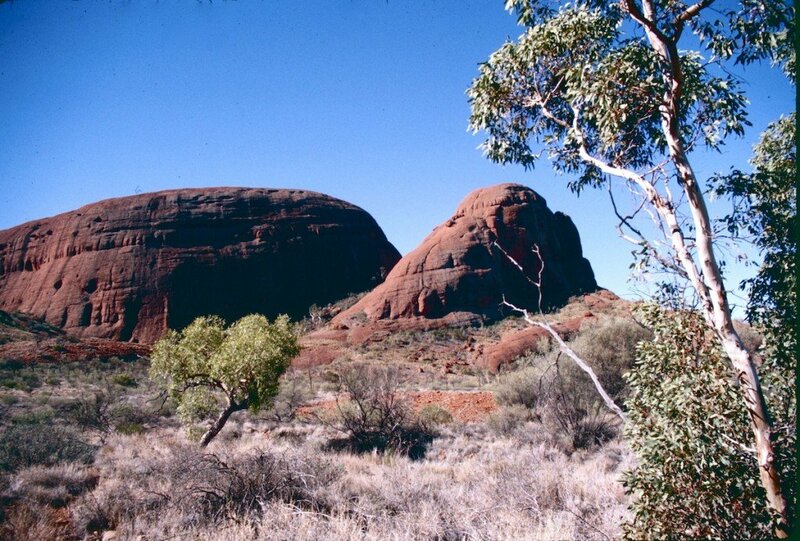 Posted in Animals, Australia, Cultures, Environment & Weather, Geography, Geology, History, Rocks and Minerals and tagged Alice Springs, Ayer's Rock, black footed rock wallaby, brolga, camel, Coober Pedy, Devils Marbles, echidna, emu, kangaroo, Karlu Karlu, Kata Tjuta, Mount Conner, Simpsons Gap, spiny anteater, Standley Chasm, The Olgas, The Outback, Tropic of Capricorn, Ukuru, wallaby on March 24, 2015 by rossmannell.